Full line catalog of 79 pages. More old MATCHBOX Stuff. Lot of 2 1979-80 & 1980-81 Matchbox Cars Collector's Catalogs Brochures. Hello fellow collectors. I have recently acquired two large collections of Danbury Mint brochures and one page flyers for their marvelous line of car and truck models. unless otherwise noted in the condition section. 1974 CORGI Die cast TOYS CATALOG England near mint to mint. overall excellent or nicer. This catalog has sat flat in a stack for the past 18 years. The pages are not torn, not worn, and it is complete. Those white wear marks are only on the cover page and the ripple fades away as you turn the pages. Matchbox Lesney 1979/80 "Matchbox" Collector's Catalogue, in great condition. Very slight wear only. 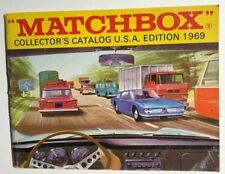 This booklet is 79 pages, and includes a complete list of Matchbox series changes from 1953 to 1978. 1981 Catalog Pamphlet Collector Book. 309 Models. Hot Wheels. 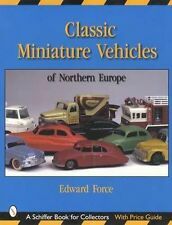 Cars; trucks; military; Circus; farming; gift sets; Corgi Classics. Guide The Superfast Years,1969/1982. 1993-Lesney's Matchbox Toys Price. (What You See is What You Get). Hello fellow collectors. I have recently acquired two large collections of Danbury Mint brochures and one page flyers for their marvelous line of car and truck models. BROCHURE ONLY, NO MODEL INCLUDED! Hello fellow collectors. These brochures are all in clean, nice condition. All colors are bright. NO CAR, Brochure only! Collectors Catalogue. complete & intact. minor wear, no writing or marks, bright colors, off-white pages. Dinky Toys #11. Tough Die-Cast Models. complete & intact. minor wear, owner's marks on first page, bright colors, off-white pages. Dinky Die-Cast Toys #12. complete & intact. minor wear, owner's marks on first page, bright colors, off-white pages. Dinky Toys #10. complete & intact. minor wear, owner's marks on first page, bright colors, off-white pages. 1:43 scale diecast made in Italy. near mint or nicer. full color photo illustrated. 4 1/8" by 8". YES, we do combine multiple wins! Up for grabs is this nice 1913 Model T Ford made by Franklin Mint. It has the COA and the original styrofoam box. A very powerful tool for a Matchbox collector. 3 books about collecting antique toys and price guides. The Official Identification and Price Guide to Collectible Toys 5th edition ISBN 0-876-37803-3 (0876378033). 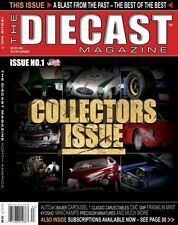 Collecting Toys A Collectors Identification and Value Guide 3rd edition. 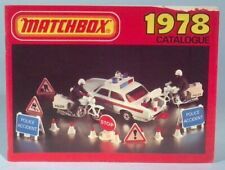 Made in England by Matchbox Lesney 1971. So many neat 1971 cars and trucks, yesteryear, King size models. Sold as shown in the many photos above. Condition : Minty - Like New. Estate find. What you see is what you get. Has wear from age use and storage. Check out the pictures for a better idea of the condition. Sold as is and as found as pictured any concerns about condition please address these concerns before purchasing. CONDITION: CONDITION IS ALWAYS SUBJECTIVE, SO WE STRIVE TO PROVIDE THE BEST PICTURE WE CAN SO YOU CAN ASSESS IT FOR YOURSELF AND MAKE YOUR OWN JUDGEMENT. WE DO NOT STATE CONDITION (I.E. MINT, NEAR MINT) UNLESS IT HAS BEEN GRADED BY A 3rd PARTY COMPANY. IN GOOD CONDITION - THE FRONT COVER IS NOT ATTACHED. This is in very good shape for its age. I AM ALWAYS STRIVING TO IMPROVE MY APPLICATION! LET'S TAK E A CLOSER LOOK AT WHAT'S UP FOR SALE. Published by Lesney Products Corporation. Collectors Catalogue 1974. USA Edition. Other new york toy fair 2006 coverage includes star trek and mini-mates from diamond select toys, robocop from darkhorse, g.i. Joe sigma 6 from hasbro, star wars busts and statues by gentle giant, marvel legends, wwe, sideshow and more are in this toy fair 2006 issue. 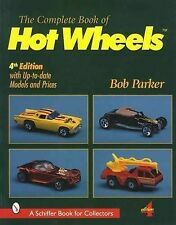 1980/81 Matchbox Product Catalog - Vintage Redline Reference Book Excellent!